You are here: Home › Types of Cover Crops › Austrian Winter Peas › Crimson Clover › Red Clover › Turnips › Cover Crop Benefits › Breaking Up Compaction › Cover Crop Roots › Soil Improvement › Cover Crops and Earthworms › Weed Suppression › Education › Cover crops for gardens – and my wife, the cover cropping queen! 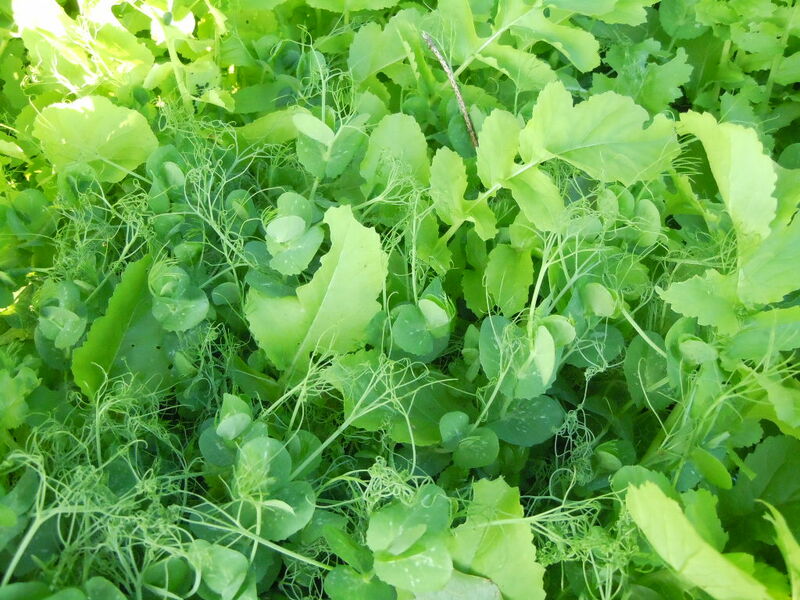 Cover crops for gardens – and my wife, the cover cropping queen! My wife Sally must love me…or at least she is observant to see how cover crops are improving the soil in our family gardens. Over the nearly 19 years we have lived in our home we have had a garden where we often have raised vegetables for the Hispanic families that we minister to. A few years ago we had nearly 50 chili plants of various types (Jalapeno, Serrano, Habanero, etc…) and we raised several bountiful crops. But we found that after raising these crops that we had few if any earthworms and our soil was becoming more compacted year after year. We decided to put the gardening on hold in some plots as we look to improve our soil. 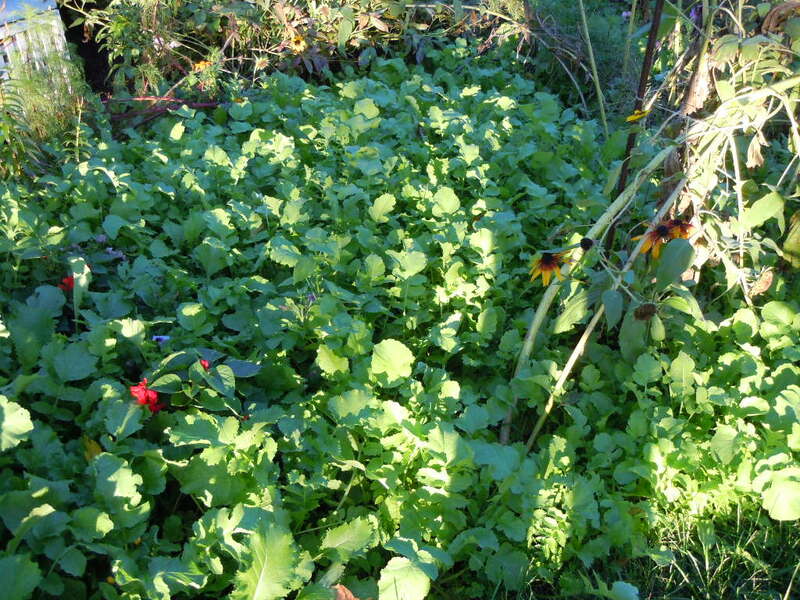 Just as last year, Sally planted different cover crops in August into some garden plots. I need to explain, these plots are in the front of our house…right near the road! My wife is a pretty bold cover crop user (and a good advertiser as well). 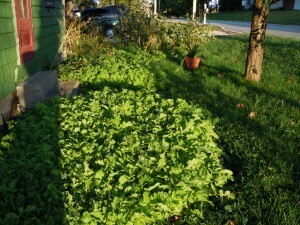 This Austrian Winter pea and cover crop radish mix fill one garden patch. Why would she plant cover crops in our gardens? The main reasons are to enhance the soil quality with earthworms and to reduce soil compaction. Sally is a pretty “eco-friendly” gal as she recycles everything and she knows the value of taking care of the soil. What we have found in the past 12 months is an increase in our earthworm population and several more roots in the soil to help build organic matter. I expect that we will have some veggies in these garden plots next year. I’m confident that Sally is doing the right thing by improving our soils…even if it is only a few square feet at a time! A mixture of turnips, cover crop radish, and crimson clover is helping build the soil in my wife's garden plots. The front of the Robison "Agronomy farm" house in Winona Lake, IN. Note that Sally let's me have a "Cliveden pasture green" house too! It must be love! 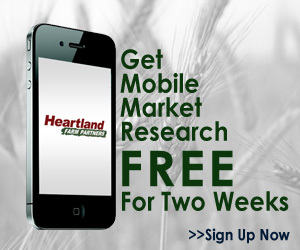 ← Planting cover crop radishes with wheat? How do you plant them? 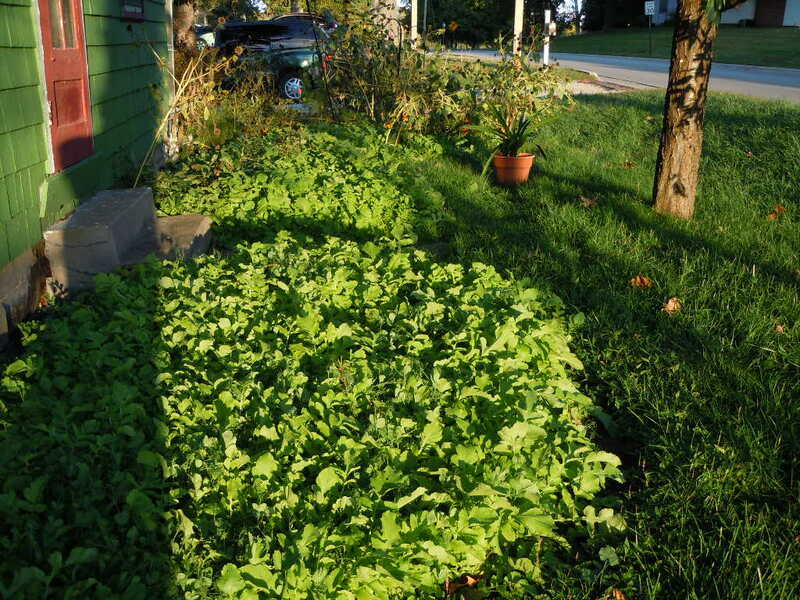 2 Responses to Cover crops for gardens – and my wife, the cover cropping queen! We planted Rye as a cover crop this winter in Portland, Oregon. The winter here is not cold enough to kill the rye. How would you kill the rye and get ready to plant this spring? Since the very beginning, I’ve never tilled the soil, and I’ve heard that tilling might not be best for rye anyway. Do you have any recommendations or tips for me? Hi Vince, If you use chemicals then using glyphosate to kill the rye when it is 6-8″ tall will work. If you do not use chemicals then rolling the rye or removing the forage (mowing close to the surface 1″ high) will eventually kill the rye. Mowing will also also you to mulch the vegetation on top of the soil which provides food for soil “bugs” and also earthworms.